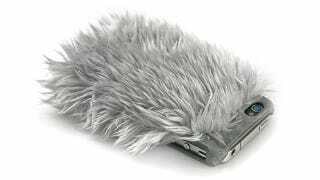 My iPhone already has no problem attracting all manner of mysterious dirt and crap, so the last thing I need is one of these Monster fur cases that's going to turn it into a magnet for dust, lint, and fuzzballs. As it stands a good portion of my day is spent cleaning grease and grime off the iPhone's display with a microfiber cloth. The last thing I need is to have to spend my time brushing and cleaning a mop of faux fur like I'm getting it ready for the Westminster dog show.